As a parent, I understand the difficulties that come with a child especially one with behavioral issues. Many concerns come up when research shows that many doctors who have labeled a child with “ADHD” are found to be misdiagnosed. I have researched all forms of ADHD treatments, treatment for ADHD in children, ADHD natural treatments, natural medicine for ADHD, and ADHD medicine for kids. The list goes on! I have tried many different types of approaches including military and boarding schools for behaviorally challenged teens and all had difficulty with my son. So, I did more research on alternative methods. Attention-Deficit/Hyperactivity Disorder (ADHD) is characterized by behaviors of inattention, impulsivity and hyperactivity. 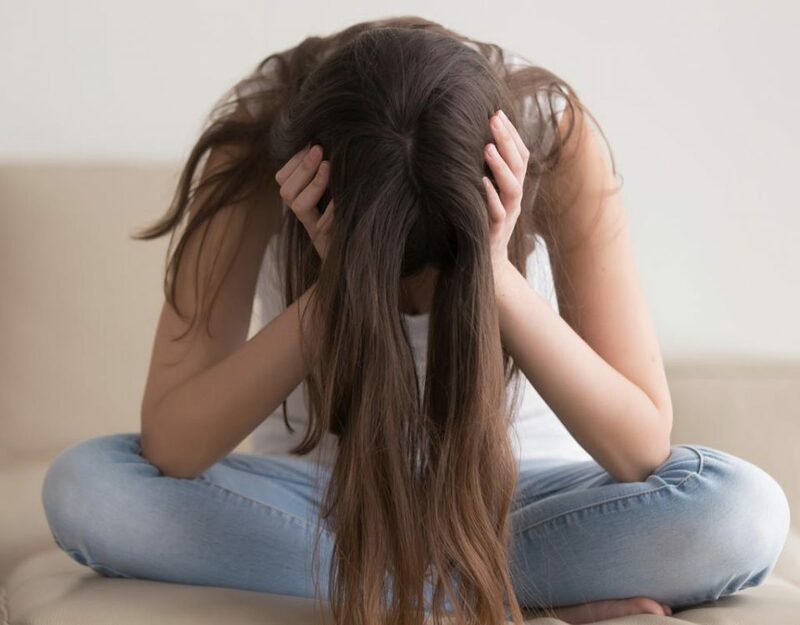 The stigma attached to this disorder is that the child is undisciplined, eating too much sugar, watching too much TV, or is surrounded by a chaotic living environment with limited attention. The most common form of treating ADHD symptoms is medication and if appropriate, cognitive behavioral therapies. As most parents notice medication only provides temporary relief from the inattention symptoms and when the medication is stopped the symptoms return. I found that it is unknown what truly causes ADHD but key factors are genetics and brain chemistry. If a parent has ADHD, then a child has more than a 50% chance of having it” (2). I thought there MUST be some connection to my son’s brain chemistry that I had not found to address the root cause of where his behavioral issues stem. I was exhausted researching and trying to find options for my son. However, through my research, I found neurofeedback. Neurofeedback retrains a client’s brain waves by conditioning appropriate brainwave patterns, which improves a brain’s response to stress, anxiety, and combats the negative symptoms associated with many other cognitive issues and disorders. With neurofeedback, individuals will develop the skills necessary to reduce or eliminate the negative symptoms they face simply by watching a movie, listening to music or playing a video game. I found that a person that experiences negative symptoms from ADHD or other learning disabilities, tend to usually have excessive slow brain waves present. When an excessive amount of slow waves are present in the executive (frontal) parts of the brain, it becomes difficult to control attention, behavior, and/or emotions. Studies show that brain chemicals, called neurotransmitters, don’t work the same in children and adults with ADHD. There also tend to be differences in the way nerve pathways work” (Pagan, 2016). Many children who have been diagnosed with ADHD generally have problems with concentration, focus, memory, controlling their impulses and moods, or with hyperactivity will see excessively high amounts of theta brain waves in the frontal lobe.“ Neurotransmitters are information pathways to communicate all different sorts of information and an individual’s behavior, emotions, and thoughts are communicated between neurons within our brains. Well, this information made so much the sense to me. Those were symptoms that seemed that they could be improved with this type of training. I had to do more research on how neurofeedback actually works so I found a local neurofeedback clinic and became a certified trainer. I learned that brain waves are electrical impulses (or synapses) that occur at various frequencies called hertz (Hz). These electrical impulses communicate within the brain and the central nervous system by telling our brain and body what to do. An example would be – If you have a family member that experiences a high level of anxiety (you know you have one! ), an excessive high frequency of beta brain waves are often present. These brain wave patterns can become dysregulated and become too slow or too fast. This is where those negative symptoms occur from brainwave dysregulation in the form of “ADHD” or other various cognitive issues. 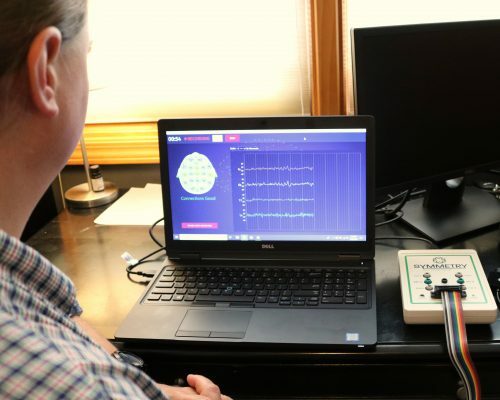 Neurofeedback targets the problem areas of the brain and reduces these unwanted symptoms by using repetitive positive reinforcement training to correct the deregulated brain wave patterns and make them more efficient. As the brain learns to retrain the neural pathways, the brain learns to remain more calm, more focused and other benefits begin to emerge such as, behavioral problems reduce, memory improves, and an increase in concentration. After consistent training with my son, I saw that he began to regain control over the negative symptoms he experienced and the really great part in our journey was that his poor behavior improved! When I meet most people they think this type of training sounds great but want to know more research. There are many studies that show that the brain is capable of change. It can reorganize brain wave patterns through consistent practice and individuals improved concentration, focus, sustain attention, decreased impulsiveness and hyperactivity, increased mood stability, improved sleep patterns, increased attention span, improved academic performance, increased retention and memory, and increased IQ scores. 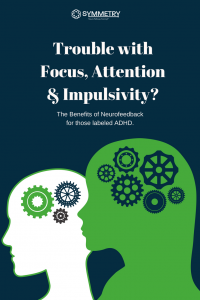 Since the late 1970’s, neurofeedback has been researched with ADHD. Dr. Lubar (1995) and his colleagues at the University of Tennessee, published a 10 year follow-ups on cases and found that in approximately 80% of patients neurofeedback substantially improved the symptoms of ADHD, and these changes were maintained. I noticed such a vast improvement with my son to the point that I contribute neurofeedback to saving his life and my sanity! I found neurofeedback to help so many people while I worked with many doctors, professionals and families in each clinic I worked. I eventually began running multiple locations since this service was able to help so many individuals and families in many different ways. A few years ago, I decided that it was my mission to help other families but in a more cost-effective way since neurofeedback can be expensive and only some insurance carriers accept coverage. I created my own branded neurofeedback training program called SYMMETRY Neuro-Pathway Training. Through years of research and training, I found the best and most cost-effective way to offer this innovative brain training to you. Let me explain further how SYMMETRY Neuro-Pathway Training works. Neuro-PT is neurofeedback that retrains brain waves through auditory and/or visual stimulation by simply watching a movie, listening to music, or playing a video game. Through training, the brain is conditioned to reduce unwanted symptoms through positive and negative reinforcement. This form of brain training is an alternative and holistic form of treatment to medication. Neuro-PT is non-invasive, uses no medication, it is painless, and long-lasting. With sessions completed twice a week, which averages between 30-40 sessions in total, many clients are able to reduce or cease their medication usage once their brainwaves are retrained and are functioning correctly. 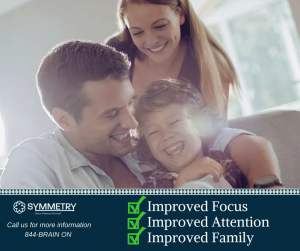 SYMMETRY aims to help students with attention, concentration, focus, impulsivity concerns and can be used in children, teens and adults. The main reason neurofeedback is especially important for managing ADHD is that medication can drastically affect the quality of life. Medication is either a stimulant, designed to improve focus – which should be given to children with extreme caution – or an antidepressant, which can have implications on mood and behavior outside of the disorder. Neuro-PT offers additional opportunities for rehabilitation through directly retraining the brain, correcting the root cause of the dysregulation and is ideal when utilized with other forms of therapy; such as, psychotherapy, cognitive behavioral therapy, occupational, physical, and relaxation therapy. Evidenced-based research show that the results of neurofeedback are long-term with continued improvements once treatment has ended due to the brain is working optimally. SYMMETRY Neuro-PT is extremely easy to start. We discuss concerns and complete a series of questionnaires that help us to get a comprehensive picture of past and current history. Once goals are established, a trainer will complete a brain map that records current brain wave patterns. This information provides the groundwork to create an individualized plan specifically tailored to meet your needs. Let me explain that each area of the brain has a specific function and influences other areas of the brain. We would be able to tell which brain wave patterns are disordered. Once identified, our experts develop a customized Neuro-PT program to correct the irregular brain wave patterns to an optimal performance level. Once the protocol is determined, neurofeedback training will begin. 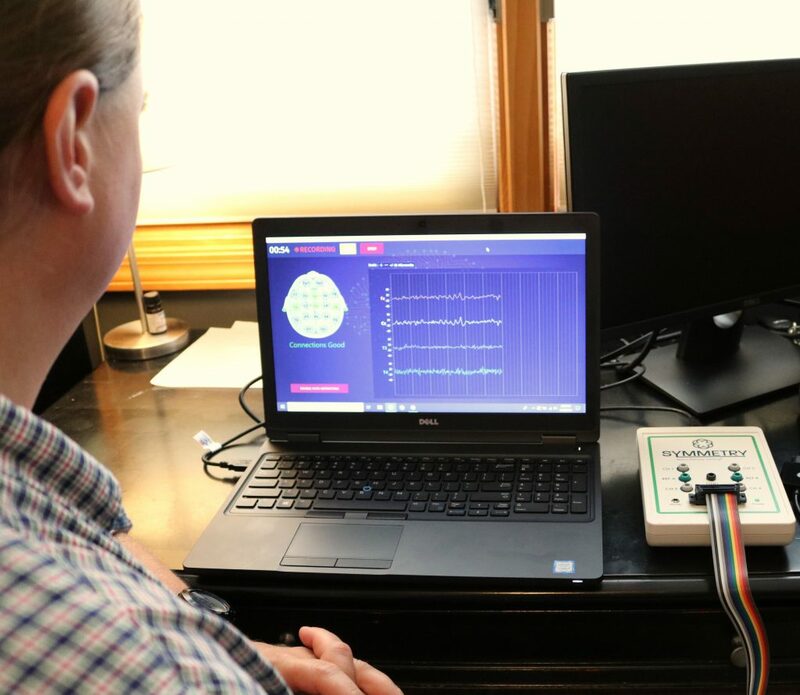 Neuro-PT, or neurofeedback training, begins with a trainer connecting sensors to a person’s scalp with a small amount of gel/paste. These sensors are read through a computer training program. The protocol used is specific to each trainee’s individual needs and will use a visual and/or auditory stimulus (movie, music or video game) that will help to train the brain with positive reinforcement. When a trainee’s brain is producing the correct brain waves patterns, the movie will show and their brain views this as a reward. If the brain stops producing the correct brainwave patterns, then the movie fades to a dark screen. Subconsciously, the brain seeks out the visual and/or auditory stimulus that is provided, and will “condition” itself to produce the correct brain wave patterns to continue receiving the positive reinforcement. If you have ever taken a course in psychology, think Pavlov’s dogs(4). Pavlov would ring a bell and pair with presenting food to a dog consistently. After a period of time, the dog began to salivate to the sound of the bell with no food. Neuro-PT is the same concept but different method. By training at least twice a week, the brain will retrain its brain wave patterns and ultimately will reduce undesired symptoms or enhance desired states of functioning depending on the goals of the trainee. 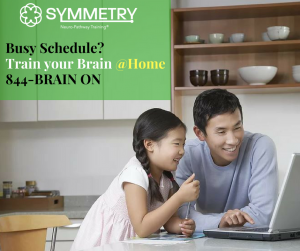 SYMMETRY Neuro-PT offers in-office training for those local to one of our branches and we have just introduced an @Home Training option at an even better price – at HALF off of what other in-office neurofeedback training providers cost! Final Thought – Neuro-PT, or neurofeedback training, can be compared to strength training for the brain. The more consistent a person trains, the stronger the brain will become and will receive better results. Training has long term results and will maintain for years after training. If you are interested to learn more, contact us and ask as many questions as you like!